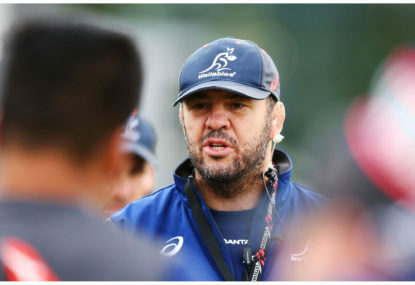 Michael Cheika’s response to the storm of the calls for changes in the preparation of the 2019 Wallabies is to tell Rugby Australia officials and the wider rugby community, in effect, to belt up. Will Michael Cheika accept Scott Johnson's 'skilful' Wallabies plan? John Singleton made a fortune for himself and his clients by simplifying the advertising he created around selling the product’s Unique Selling Proposition. 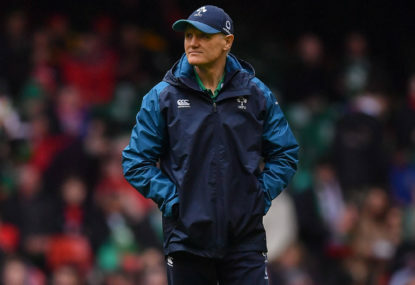 A principle of philosophy is that ‘not to go forward is to go back.’ Applied to rugby this principle requires successful teams to improve if they want to remain successful. How seriously should the Greg Growden allegations of possible match-fixing by three Wallabies “several years ago” be taken by rugby authorities in Australia and by World Rugby officials? Trigger warning. In my opinion, any world-wide championship format put forward by World Rugby has to be discussed with a peg on your nose. 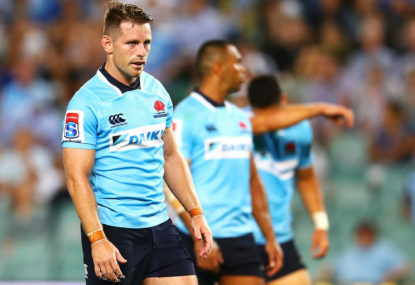 The bad news coming out of the first two rounds of Super Rugby matches is that most of the senior Waratahs are out of form and should be facing the sack from the Wallabies World Cup squad. He’s back! Greg Growden’s ‘Ruck and Maul’ column appeared in Friday’s Sydney Morning Herald for the first time in years. 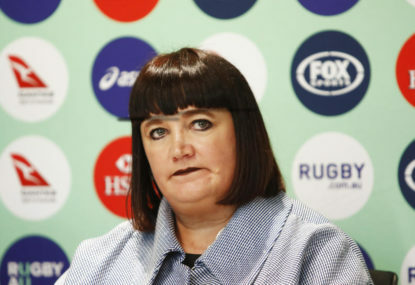 Heads must roll at the end of this annus horribilis for Australian rugby. A win is a win, the old adage goes. 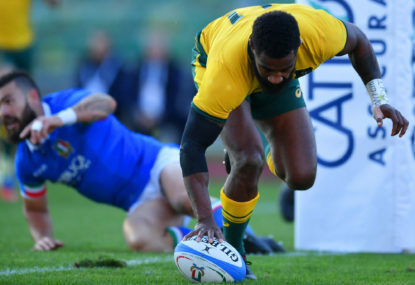 So on paper, at least, the Wallabies 26-7 victory over Italy, with a four tries to one advantage, looks impressive given the recent run of dismal results for Australia. So the Michael Cheika Wallabies have failed to win a Test against the All Blacks in 2018, going down in the 37-20 wipeout at Yokohama’s Nissan Stadium on Saturday. 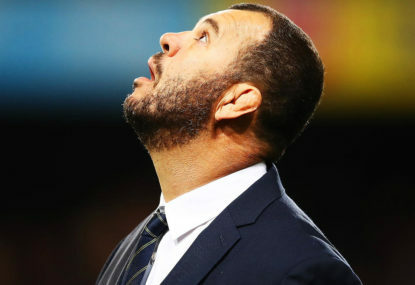 Has the Wallabies' Houdini-like escape against the Pumas saved Michael Cheika and his coaches? Has the brilliant, Houdini-like escape from a smashing defeat, with the Wallabies scoring 38 points in the second half against the Pumas, saved Michael Cheika and his coaching team from being sacked? 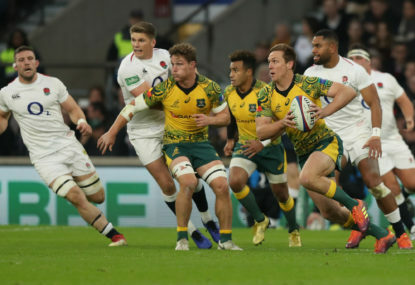 So there were the Wallabies pinned near their tryline, with a precarious five-point lead, and minutes to go before full-time. Just as correction. The bat of my victim was slung around his NECK and not his knee. My memory is that Haverford College in Philly was the home ground of Bart King. When I was studying at a university in Washington D.C. a team of diplomats took the bus from Washington to Philly to play the Haverford College side. I was roped in as a diplomat for the day. My memory of the ground, this was the the mid 1960s remember, was that it was modelled on the old English village grounds. There were trees surrounding the boundaries. The pavilion was in Ye Old English mode. When you went in to change you saw jock straps, old gloves and other gear casually strewn around. The cricket ethic sort of stopped there. The Haverford side seemed to me made up of baseball players. Most of them were dressed in Vietnam War gear with bandanas around their heads. They had wicked, politically correct wispy beards and they yelled and hollered whenever anything of moment happened. I opened the batting with an Indian diplomat. Early on, I nudged a ball to third man and sauntered through for a run. My partner was even slower between the wickets than I was. The throw from the out-field came in like a rocket, hard, flat and fast. The diplomat was run out by yards. The only wicket I got was when I bowled to to the last man in who was dressed in his battle fatigues and took his stance with his bat slung around his knee, in the baseball manner. A quickish yorker castled him before he could get the angle of his bat at the perpendicular. In the dressing room, though, after the game I did notice material on Bart King whose influence still prevailed but whether this is the case now, who knows? Thanks for reviving the memory of America’s greatest cricketer and arguably one of the great bowlers in the history of the game. Thanks for this. Homer has nodded, once again, unfortunately. For Auckland please read Wellington. As you say, the dead rubber will be played at Auckland on 22 October. Harry, congratulations on a terrific piece of writing and a deep insight into what makes Michael Cheika run. In the end, sport is about the people who participate in whatever the activity is. These people have a history, going back generations and into the present, that offer clues as to why they behave, play, coach and talk in the way they do. The metaphor involved with linking the sinking of the SS Waratah with the sinking fortunes of the Wallabies and former Waratahs coach is brilliantly apt. 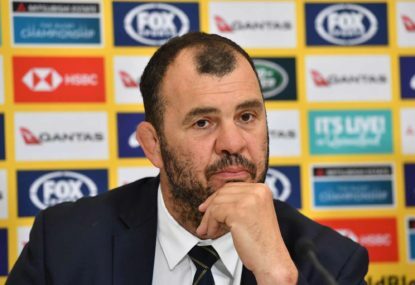 Linking Michael Cheika’s personal history with the history of the Maronite communities in South Africa and Australia provides a social history perspective and context for understanding what makes him what he is. This is sports writing, or should I say writing, of the highest quality. It is a credit to you. The readers of The Roar (and dare I say it, Michael Cheika himself) are greatly indebted to you for creating this insightful essay. Brett, don’t forget that Mark Ella in The Australian last week made similar points about the Giteau Law players as I did, even more trenchantly than me, I might add. 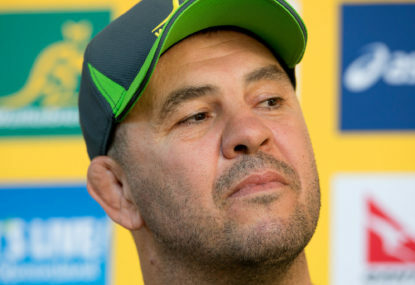 “(Michael Cheika) has made a calculated gamble by bringing back a legion of veteran Wallabies from France ,,, If they could not beat the All Blacks at the peak of their careers, how will they do it now?” he asked. Perhaps “the credit for a Wallabies win” might be shared between me and Mark for inspiring the players into a victory. Is this not the role of commentators? The combined height and weight of Paddy and Will Skelton might have made a decent-sized second-rower, I reckon. Pot Hale because you can’t understand what Hansen says, it does not mean that Hansen is not making sense with his comments. Rust never sleeps: Can the out-of-form Wallabies win at Melbourne? Mart, you are right. What Nathan Gray did was very wrong to interfere with the England player trying to catch the ball and restart play quickly. He should have been penalised by Romain Poite and banished from the sideline. Bad sportsmanship like that cannot be condoned. There should also be some sanction from World Rugby, in my view. Arithmetic class for me, I fear. 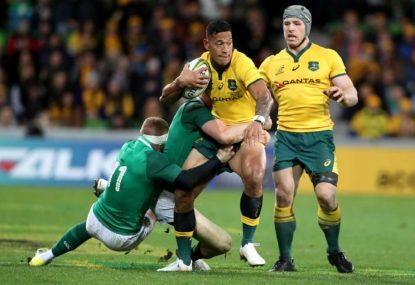 The three missed conversions cost the Wallabies 6 points, not 8 points. 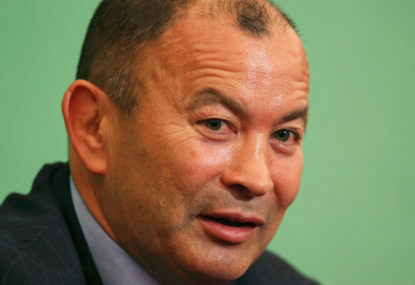 It seems clear, too, that Eddie Jones out-foxed Michael Cheika with his Bodyline threats. 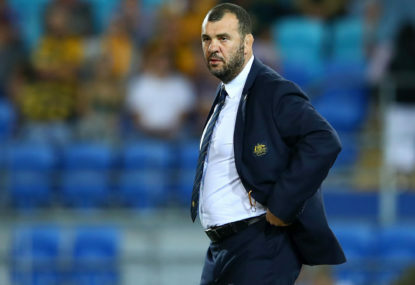 As Paul Cully points out in the SMH, Cheika stacked a 6 – 2 bench to counter the threat of a juggernaut England pack and backline.He swallowed the Bodyline line. But when Horne went off, with only two back reserves, one of whom had to be a halfback, the Wallabies had no cover on the wings. Just a slight correction to this. Under the system I put forward, each country has a team with a home quarter final. That team is the home side that has the most points at the end of the round robin of the tournament. This adjustment is important for commercial reasons. It mean that at least at the quarter final stage each country, Australia, South Africa and New Zealand has a guaranteed final. The final quarter final spot goes to the next team from any of the conferences with the most number of points. Then there are five wild card teams selected from their position on the points table. From from old bugger to the real Old Bugger, a paplable hit. A brainstorm on my part. Mea culpa, mea culpa, mea maxima culpa. Can the Waratahs beat the Brumbies to the finals with bonus points? Apologies to Leolin Zas for getting his name wrong. I of all people should be aware of Z. The King’s Cup 1919 was played between army teams from Britain, Canada, South Africa, Australia and New Zealand. Paul and Patrick, a memorable long essay that gives us the essence of Tibby Cotter, the man, the cricketer and his times. One of The Roar’s best! Sean, thank you for this brilliant and moving account of the war service of Dr Herbert Moran, a giant of Australian rugby and medicine. It was moving to read that the slaughter became almost too much for Moran to endorse, although he stuck to his determination to see the Great War through to its bitter end. 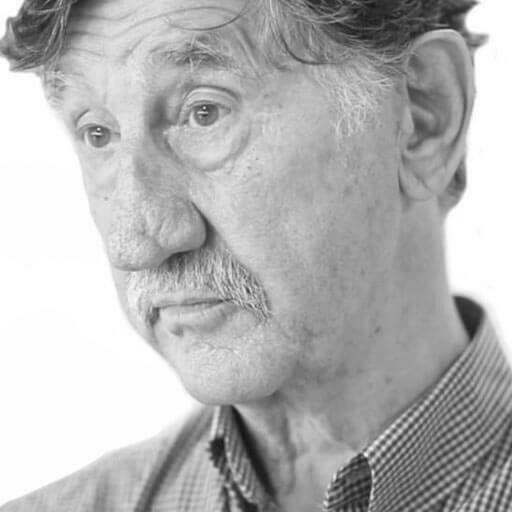 Dr Moran later became a Macquarie Street specialist treating cancer patients with the new radium treatments. Re the drop goals in the 2015 RWC final, it was Dan Carter who made the two strikes, of course. Thought I would make this point before I was accused of believing that Jonny Wilkinson was an All Black. Is Liam Gill the best all-skills Aussie number 7? Rohan Hoffman is an Australian referee and therefore was a neutral in the match you instance. Should Jaco Peyper have refereed the Stormers-Brumbies match? Carlos get ready to eat your words. Owens did review the video evidence and then awarded the try. How many SRU players have gone on to play for the Wallabies in the last 10 years? The SRU is the peak of the pyramid for amateur rugby. 1. Train Without A Station and Brett McKay do not seem to understand that the Sydney grade sides are the bottom of the pyramid for the Wallabies. They are NOT the top of the pyramid for amateur rugby. 2. At the top of the pyramid are 40 or so current Wallabies. Rugby players and Wallabies the grade club competitions in Melbourne and Perth have delivered? league-playing schools and women’s rugby will deliver to Australian rugby? clubs and, with them, the strength of the game here. game in this country understands. enthusiastic and dedicated supporters of the rugby game. The draws in the past have also been problematical. 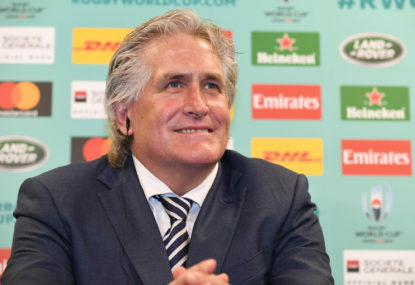 Perhaps it is time now for SANZAAR (now with an extra A apparently) to put people in charge of the draw who know something about the rugby and cultural histories of the relevant participating nations. This presumes, of course, that SANZAAR itself has this sort of elementary knowledge. Readers of The Roar will know that I have been deeply unimpressed with the managerial expertise of the now SANZAAR. Andy Marinos’ first moves, including the introduction 3-try plus bonus point system, do nothing to suggest that improvements are on the way. Incidentally, when it comes to the views of an administrator and a successful coach on how a particular initiative will work out in practice, I’ll go with the coach. 1. Kieran Read (NZ) 2. Sergio Parisse (Italy) 3.Taulupe Faletau (Wales) 4. Duane Vermulen (SA) 5.Louis Picamoles (France) 6. Billy Vunipola (England) 7. Samu Manoa, the USA number 8 described as “the greatest USA player ever.” 8. James Heaslip (Ireland). 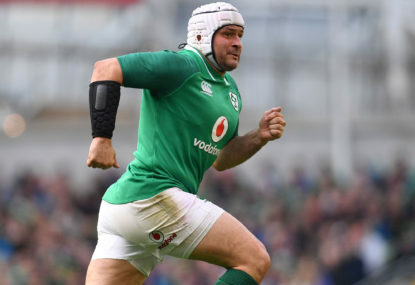 As David Pocock played at number 8 in the 2015 RWC this suggests that this very good loose forward is not rated as highly in the UK as he is in Australia. Richie Gray, as you say, is the breakdown expert, not Richie Guy who was a NZRU chairman and All Black. Wayne Smith’s intervention was in 2004, not in 2007. Desperate times require desperate attempted remedies. in front of the Springboks coaching staff and players. And the lack of preparation by the Springboks before the match was indicative, too, of the different mindsets between the two teams and their coaching staff. Congratulations to yourself and to The Roar for bringing this memorable essay to our readers.